Ontario unions are bracing for maximum pain on minimum wage, as Premier-designate Doug Ford is set to roll back the $15 an hour rate. The Ontario Federation of Labour, an umbrella group representing more than a dozen provincial labour groups, is warning of the impact that will have. “People need to understand, a $15 an hour minimum wage, according to the new Premier of Ontario is not going to happen as of January.” said Chris Buckley, President of the OFL. “That’s a negative effect on 1.7-million workers." Minimum wage was given a significant boost under Kathleen Wynne’s Liberal government, as the party tried to eat into NDP support before the June 7 election. “We went from $11.60 an hour to $14 an hour (on January 1, 2017), that’s a huge victory.” Buckley said. While wages were supposed to increase to $15 an hour on Jan. 1, 2019, the Progressive Conservatives, under then-leader Patrick Brown, signaled their intent to delay its full implementation until 2022. Brown promised a 25-cent increase per year for four years. After Brown’s resignation and Ford’s ascension to the leadership, plans for minimum wage soon disappeared and were replaced instead with a pledge to erase the provincial income tax for minimum wage earners. 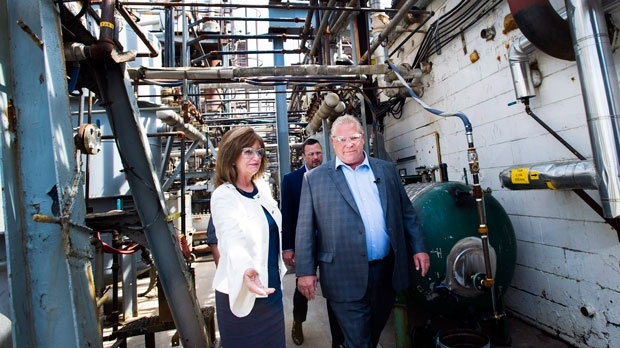 Ford’s platform, called a Plan for the People, promised to spend $558 million a year to give minimum wage workers a tax credit, which the OFL says isn’t the same as lift in income. Buckley requested a meeting with Ford on the very night the PC party was given a majority mandate. He says he hasn’t received a response but is willing to wait until Ford is sworn in on June 29th to make another request. Meanwhile, advocacy group Fight for $15 and Fairness is staging a rally on the lawn of Queen’s Park this Saturday to demand that the increase go ahead as planned. Buckley says he will be there as well. Correction: The advocacy group Fight for $15 and Fairness was incorrectly identified as Fairness and 15 in a previous version of this article. CTV News Toronto regrets the error.